This week’s fossil is from close to home. In fact, it sit in my office. The above is a trace fossil named Petroxestes pera. 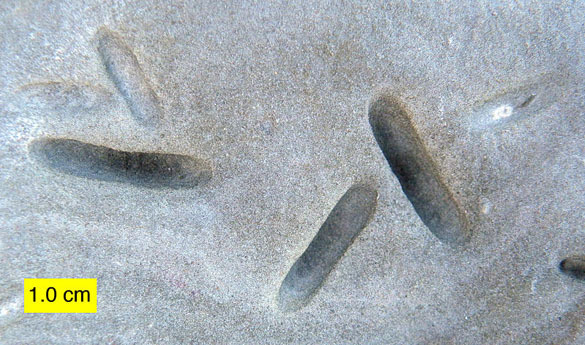 It was produced on a carbonate hardground by a mytilacean bivalve known as Modiolopsis (shown below). Apparently the clam rocked back and forth on this substrate to make a small trench to hold it in place for its filter-feeding. This particular specimen of Petroxestes was found in the Liberty Formation (Upper Ordovician) of Caesar Creek State Park in southern Ohio. This is a place many Wooster paleontology students know well from field trips. The original Petroxestes was at first known only from the Cincinnatian Group, but now it is known from many other places and time intervals, even including the Cretaceous and Miocene. It is a good lesson about trace fossils. They are defined by their morphology, not what organisms made them. It turns out that this slot-shaped trace can be made by other animals besides Modiolopsis, which went extinct in the Permian. Jagt, J.W.M., Neumann, C. and Donovan, S.K. 2009. 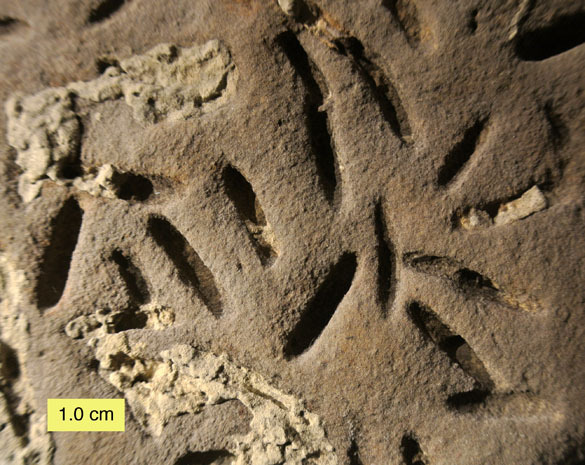 Petroxestes altera, a new bioerosional trace fossil from the upper Maastrichtian (Cretaceous) of northeast Belgium. Bulletin de l’Institut royal des Sciences naturelles de Belgique, Sciences de la Terre 79: 137-145. Pickerill, R.K., Donovan, S.K. and Portell, R.W. 2001. The bioerosional ichnofossil Petroxestes pera Wilson and Palmer from the Middle Miocene of Carriacou, Lesser Antilles. Caribbean Journal of Science 37: 130-131. Pojeta Jr., J. and Palmer, T.J. 1976. The origin of rock boring in mytilacean pelecypods. Alcheringa 1: 167-179. Tapanila, L. and Copper, P. 2002. Endolithic trace fossils in Ordovician-Silurian corals and stromatoporoids, Anticosti Island, eastern Canada. Acta Geologica Hispanica 37: 15–20. Wilson, M.A. and Palmer, T.J. 1988. 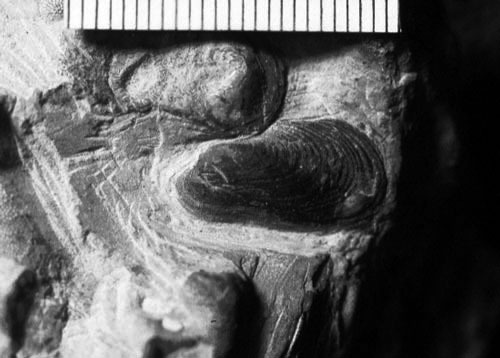 Nomenclature of a bivalve boring from the Upper Ordovician of the midwestern United States. Journal of Paleontology 62: 306-308. Wilson, M.A. and Palmer, T.J. 2006. Patterns and processes in the Ordovician Bioerosion Revolution. Ichnos 13: 109–112.